Niue is an island nation located in the South Pacific Ocean. It is commonly known as “Rock of Polynesia”. Although it is self-governing, it is in free association with New Zealand. This means that the sovereign in right of New Zealand is also the head of state of Niue, and most diplomatic relations are conducted by New Zealand on Niue’s behalf. Niue is located 2,400 kilometres north-east of New Zealand in a triangle between Tonga, Samoa and the Cook Islands. 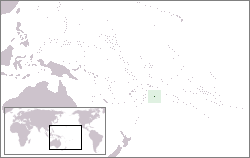 European involvement in Niue began in 1774 with Captain James Cook‘s sighting (landing was refused) of what he named “Savage Island”. Legend has it that Cook so named the island because the natives that “greeted” him were painted in what appeared to Cook and his crew to be blood. The next major arrival was the London Missionary Society in 1846. Briefly a protectorate, the UK‘s involvement was passed on in 1901 when New Zealand annexed the island. Independence in the form of self-government was granted by the New Zealand parliament in the 1974 constitution. In January of 2004, Niue was hit by the fierce tropical storm Cyclone Heta which killed two people and caused extensive damage to the entire island.